A thorough exploration of Easter Island on foot combined with some of the best walking trails of the Atacama Desert. A superb combination/contrast in this two centre trip, really well paced and giving time to explore both places well. I remember reading Thor Hyerdahls book Aku Aku when I was about 14 years old. I thought it was the best book I’d ever read and it left an indelible impression on me. Later I saw a re-run of Thor Hyerdahls Kon Tiki film and I promised myself that one day I would visit Easter Island. It did not disappoint, it is a stunningly beautiful island and the mystery still remains. Well organised and good itineraries. In each destination there were days when we did not see other tourists. Easter Island has to be one of the strangest mysteries on the planet. Many of us, of a certain age, will remember seeing Thor Heyerdahl’s film of his 1947 Kon Tiki expedition and reading his powerful books that first voiced the theory that the people of Easter Island came originally from South America. He proposed that the Inca sun worshipers of Peru sailed towards the setting sun on balsa wood rafts and by chance made landing on Easter Island, a tiny island in the middle of the Pacific. 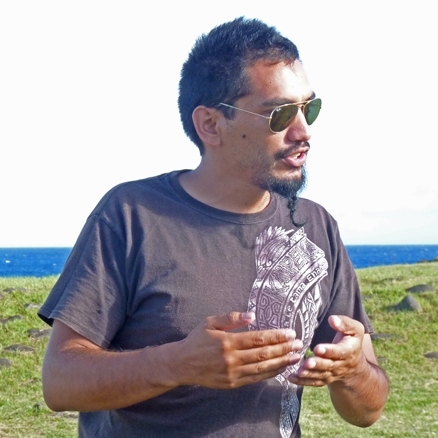 His theories today are largely discounted but why the 800 giant statues were carved, how they were transported around the island, and where the Rapa Nui people came from is still hotly debated. Our walking holiday on Easter Island is a thorough exploration of this beautiful volcanic island. Each day walk has a different objective and include visits to the quarries where the stones were made, walks to the top of the three main extinct volcanoes, a fabulous walk along the northern coastline, and visits to the caves where the Rapa Nui hid from slave ships. We provide knowledgeable English-speaking guides who will show you many amazing things, such as the stone tower observatories that the people used for stargazing. There is free time as well, and you might like to horse ride, hire bicycles, take a boat trip, or go scuba diving - local payment required. We have combined our time on Easter Island it with five and a half days in Chile, walking on some of the best canyon trails of the Atacama Desert. See the Rainbow Valley, salt flats, lagoons and famous geysers before returning to Santiago prior to the flight to Easter Island. Meal arrangements: Bed and Breakfast in Santiago. 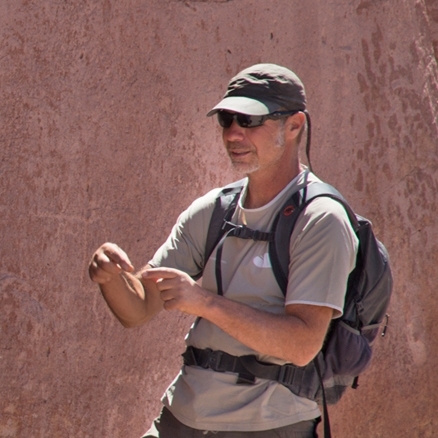 While on the Atacama trek breakfasts and lunches are included. On Easter Island all breakfasts are included and all picnic lunches for day walks are provided. There are very many excellent restaurants in Hanga Roa where you can enjoy your evening meal. Fly to Santiago. Afternoon city tour. Fly to Calama. Drive to San Pedro. Walk in Kari Canyon. Trek the Rainbow Valley and Yerbas Buenas. Evening visit to an observatory. Walk around Menique and Miscanti lagoons. Visit Atacama Salt Flats. Trek to Taito Geysers and Copa Coya. Drive to Salar de Tara, view the rock formations and lagoon. Fly to Santiago. Fly to Easter Island. Walking tour of Hanga Roa town. Visit several key Moai sites and Anakena beach. Walk from Ana Kai Tangata to Rano Kau crater and continue to Orongo village. Afternoon at leisure. Visit Ahu Akivi and walk to Terevaka volcano. Visit Tongariki. Walk to Poike volcano. Walk from Ahu Tepeu to Costa Nort and on to Anakena beach for a barbecue. Walk to visit caves, plus a free day for optional activities. Fly to Santiago. Transfer to hotel. Rest of day free. There are a number of English speaking guides on the island, including Hugo and Christian. Both have a great interest in the Island's history and love sharing their wealth of knowledge with fellow trekkers. In mainland Chile, we use expert, English-speaking local guides who have an intimate knowledge of the area and an infectious passion for nature. They are very hard-working, attentive and helpful. Day 1 - Depart London. Fly overnight from London to Santiago. Day 2 - Arrive Santiago. Group transfer to hotel. Afternoon city tour. Today you arrive in Santiago, 520m/1,706ft, where you will be met and transferred to your hotel for a rest and freshen up. You will then have a briefing from your guide. In the afternoon there will be a city tour which begins with you being picked-up from the hotel and taken downtown to Mercado Central. This well-renowned market, popular with locals and tourists alike, supplies many Santiago homes and businesses with fresh fish all year round. Next to the market is Plaza de Armas, Santiago’s main square and kilometre zero, the point from which all distances in the country are measured. Famous architecture in the square includes the Metropolitan cathedral and the central post office, originally built as a house for Spanish conqueror Pedro de Valdivia. Close by stands the Justice Tribunal, in a neo-classical building housing the Supreme Court and ex-Congress. From here you walk towards the Alameda, the main street of the city centre, via the busy pedestrian walkway Paseo Ahumada. This walkway is famous for its crowds, shops, and diversity of people. Once you reach the Alameda you walk a couple of blocks west to the Presidential palace, La Moneda. The palace, a model of 18th century colonial architecture, is one of Santiago’s most recognisable landmarks and a symbol of Chile’s political past and its famously turbulent history. Next you climb Cerro Santa Lucía, where Santiago was founded in 1541 by Pedro Valdivia. From the top of the hill there is a great 360° panoramic view of Santiago. Your tour finishes by visiting the bohemian Lastarria neighbourhood, lined with cafés, restaurants, small theatres, bookstores and boutique shops. Afterwards you will be driven to your hotel. Day 3 - Fly to Calama. Drive to San Pedro, 2,400m/7,874ft. Kari Canyon walk - 2 hours. Upon arrival at Calama Airport, 2,299m/7,543ft, you are driven straight to San Pedro de Atacama, past the impressive rock formations of the Cordillera de la Sal (Salt Mountains). Once in San Pedro you check into your hotel, where you can have a short rest before it's time for the first excursion in the vast desert ripples of Kari Canyon. You will drive 20 minutes to a viewpoint where you can look out over the majestic Cordillera de la Sal and the huge sand dunes leading to Kari Canyon. From here you will begin your moderate hike (3.5km, approx 2 hours) initially along a rocky plateau before dropping down a small rocky climb onto the magnificent sand dunes which you then walk along before descending into the Kari canyon. The canyon set at 2,550 m altitude, is an old dried riverbed with beautiful rock formations, grottos and caverns. At the bottom you meet you vehicle and after a short drive you will arrive at a lookout point where you will witness one of the world's most beautiful sunsets over Moon Valley, intensified by the warm colours of the sand dunes stretching out to the horizon. Day 4 - Trek the Rainbow Valley and Yerbas Buenas. Evening visit to observatory. Today you will trek into one of the canyons and valleys of the desert. Following a short transfer you will start by crossing rocky, scrubby ground on a wide jeep track very rarely actually used by vehicles. After climbing a small hill the effort is rewarded by the fantastic view down into Rainbow Valley. This is aptly named due to its spectacular rocks and cliffs eroded into spiky shapes and in all shades and colours, including beautiful greens, purples, browns and blues. A place to linger and enjoy the marvels of nature. From here you transfer a short way past the village of Yerbas Buenas, 3,000m/9,840ft, and on to the site of the rock art. Returning to San Pedro you will have time to relax and have dinner before being taken on a guided astronomical tour at one of the local observatories to view the stars and planets through one of the impressive telescopes. The tour starts with an introduction to the night sky by a knowledgeable and enthusiastic guide and you will then have the chance to gaze at the incredibly clear skies found here in the desert. Walk distance: 12 km. Max altitude 3,100m/10,170ft. Min altitude 2,400m/7,874ft. Day 5 - Walk around Menique and Miscanti lagoons - 1-2 hours. Visit Atacama Salt Flats. A drive of around 2 hours brings you to the lagoons of Miscanti and Meniques considered to be one of the undisputed highlights of the region. From the parking spot you are greeted by a spectacular mountainous landscape with high snowy peaks of over 5,000m surrounding the lagoons. These lagoons are home to a variety of local fauna and are full of turquoise which creates a truly incredible landscape, creating an unforgettable memory of the region. The mountains are reflected in the still waters as you walk down to the Miscanti lagoon. This is a protected area where the rare horned coot nests and you are only allowed to walk on the pathways. As you walk on to Miñiques you might see herds of Vicunas grazing on the clumps of yellow grass growing here, a particular favourite of these protected animals. You will continue in the vehicle to Laguna Chaxa, a national reservation in the middle of the Atacama Salt Flat, home to beautiful Chilean, Andean and the rare James flamingos. There are also many other wading birds e.g. avocets and plovers feeding here in these salt lakes. The salt flat measures 100km x 50km and the ground is in shades of grey/brown/white due to the salt crystals which have formed into twisted shapes. The salt grass growing here is the only plant which can exist in such a harsh environment. Walking from the information centre you can marvel at this unique landscape and beautiful bird life. On the return drive you may, if time, stop at Socaire, a small village with an interesting 200 year old church. Day 6 - Trek to Taito Geysers and Copa Coya - 5 hrs. Today starts with a 1 hour 45 min and 100km drive to visit the celebrated Tatio Gesyers. these are some of the highest geysers in the world and it is the third-largest geyser site on Earth, with over 80 active geysers. By arriving just after the vast sunrise crowds have dispersed the Gesyers can be appreciated in sunlight at a more relaxed pace. It is also a more pleasant temperature, as situated at an altitude of 4,300 m it is a very chilly experience before sunrise! The geothermic field is truly incredible, from almost 900 meters below the earth, boiling steam bursts up to 40 meters above the surface of the earth. In this area it is typical to find wild vicuñas, an endangered Andean camelid that are highly protected in Chile and were rescued from the verge of extinction thirty years ago. From the geysers your walk will begin, lasting approximately 3 hours, towards a high Andean plateau with the same name as the trail - Copa Coya 4,500m/14,764ft. The puna played an important historical role centred around the llareta plant which was used traditionally for fires, although nowadays its slow growth means it’s not a feasible fuel option. During the walk you will pass through typical Andean vegetation and maybe see some vizcachas, a small mammal similar to a chinchilla. Lunch will be taken along the trail with time to rest and enjoy the amazing surrounding views. The walk finishes with a steep uphill climb made worthwhile as it leads to a wonderful view of many Alto Loa villages which shows a different view of Atacama than normally experienced. The day ends by returning to the hotel at around 4pm. Day 7 - Drive to Salar de Tara. View the rock formations and lagoon. Today there is a fair amount of driving but it is very worthwhile as you get to see some amazing landscapes, rock towers, wildlife and mountains and there are plenty of viewpoints to stop and stretch your legs along the way. Leaving San Pedro you drive up towards the Bolivian border passing many vehicles transporting goods from the Chilean ports being imported into Bolivia. After the turn off to the border post you are heading towards Argentina with very little traffic around. The road climbs passing wide open spaces and mountains and along the way you might well see cycle tourers battling the ever present winds on their way from or to Argentina and maybe feel a sense of discomfort on their behalf! You will pass some wetlands where there is birdlife and probably vicunas grazing and drive over a pass, Cerros de Pacana, 4,900m/16,076ft, before heading down and off the main road towards the Salar de Tara. Here you will pass vast rock columns known as the Tara cathedrals, a chain of rock formations eroded by the extreme weather. Continuing on the 'road' is just tyre tracks through the desert and can be quite rough. The salt flats and lagoon soon appear together with the ever present llamas, vicunas, vizcachas and flamingos all surviving in this harsh environment. Here you can take a walk and soak up the huge landscape and raw beauty of the desert. Return to San Pedro for your final evening in this remarkable part of Chile. Day 8 - Free morning. Fly to Santiago. The morning is free to relax or explore the village, visit its cafes, handicraft shops and church. You can try a local restaurant for your lunch before the transfer to the airport and the flight back to Santiago. Day 9 - Fly to Easter Island. Museum visit and guided walking tour of Hanga Roa town including Ahu Tahai. A short transfer to Santiago airport for the 5 hour 10 minute flight to Easter Island. Taking off there are good views of the Andes and their foothills stretching out to the coast. Excitement builds as you approach the island which you overfly and then turn back to drop slowly on one of the longest runways in the world. It was built and the length increased by the Americans to act as an emergency landing site for the space shuttle. Already you will notice a relaxed laid back atmosphere as you walk through the large low airport building. Drive the short distance to hotel O’Tai for your first briefing and welcome lunch. In the afternoon you will drive to the museum for a guided tour followed by a walking tour of the town including the cemetery, church, the ceremonial complex of Ahu Tahai and other places of interest. The town of Hanga Roa really feels like a south sea island. It is very green with lots of tropical plants, flowers, palm trees and wide roads with low buildings. There are shops, cafes, restaurants, the harbour where you will find the dive centres, and the catholic church which sits at the top of the town. Anchored off the harbour are usually a few yachts whose owners must have sailed across the Pacific to get there! The town contains many fine wooden carvings and it is interesting to note that the bird man symbol is incorporated into many of the figures (you will hear more about the bird man culture on your 3rd day on Easter Island). Day 10 - A full day tour to include Tahai Ahu, Vaihu, Rano Raraku quarry, Pito Kura and Anakena beach. After your first of many great breakfasts at the hotel your minibus will pick you up and drive the short distance to Aku Tahai where you will see your first proper Moai and begin to hear something of their history and some of the theories. Firstly, it is thought that they were erected in a form of ancestor worship and having been brought from the quarries all the way over to their final resting place they were then erected on the stone platforms called ahus. The main construction probably started around 1,100 or 1,200 AD and building probably continued into the 1600’s when it is thought that warfare broke out between the various tribes. Probably the various tribes knocked each others statues over. It is thought that the statues were built on their ahus facing inland and facing the villages that they were supposed to protect. The Rapa Nui people felt that the power of their ancestors resided in these statues and therefore protected their individual villages. In any event at Aku Tahai the fallen statues have been re-erected, by the American archaeologist William Mulloy between 1968 and 1970, and you will see that one has been given eyes. Apparently many of the statues did indeed have eyes and this was not known for a long time. 18 sets of eyes were found and others have been identified in museums around the world. The eyes were designed just to sit in the eye sockets. They were made of coral and the centre made of the same red stone as the statues hats. You now drive on to Vaihu which is about 10km from Hangaroa and is a classic example of an ahu where all the statues have been knocked over and have been left as they were. Here you can see some of the hats that have rolled off the fallen statues and lie scattered around. Here you can see that the hats are made from a completely different stone, reddish in colour, and much lighter than the statues themselves. It was therefore easier for them to put the hats on top of the erected statues, although quite how they did this is still debated. Next you are going to move on to one of the highlights of the Island is the main quarry where the statues were carved. This is called Rano Raraku. When conflict finally broke out on the island the carving of the statues was abandoned and the quarry at Rano Raraku is an extraordinary place. Here there are dozens of finished statues already on their way towards their resting places but left abandoned. There are also dozens and dozens of statues in various stages of carving in the rock face itself. The quarry is located in the south east end of the island and it is from here that there are a whole series of “roads” that criss cross the island, and which must have been used to transport the statues to their ahus. There are something like 400 moai in various stages of development. It is all a very strange sight, particularly because most of the statues that had started their journeys have sunk deep into the ground so that only the heads are left visible. You might wonder how the statues were carved when there was no metal on the island and the answer to this apparently is that chisels and hammers were made from a much harder obsidan rock found elsewhere on the island. The much softer volcanic tuff rock that the statues are made of were therefore carved with the flints made from shards of obsidan. Some of the largest statues on the island are here at Rano Raraku there is in fact the largest moai on the island at the highest part of the walking route around the quarry. It is 21m long and the head alone is 7m. It Is estimated to weigh more than 200 tons. There will be plenty of time to hear lots of the amazing stories from the guide and wander around the site and look at the ranger station at the foot of the quarry. From Rano Raraku you now move on to Pito Kura. This site has the largest Moai ever transported from Rana Raraku and erected on a platform. The Moai is almost 10m tall and now lies face down with its top knot next to it. On this site there is another mystery. There is a very large round stone almost like an egg which is magnetised. Place a compass near it and the needle goes crazy. The legend is that the first king of the island Hotu Matua brought it with him from Polynesia. Apparently there are other magnetised stones in other parts of the island. Lastly, you proceed to Anakena beach which is some 18km from Hanga Roa. This is Easter Island’s main beach and is an absolutely idyllic place fringed with palm trees and a very nice place to hang out at the end of a fascinating day. Snack lunch. Day 11 - Trek to Rano Kau crater, 384m/1,260ft, and continue to Orongo village. Afternoon free. It is a short drive to Ana Kaitangata. This literally means “man eating cave” and certainly there are legends about cannibalism on the island. The roof of the cave has some very interesting paintings. Unfortunately the cave may be closed due to a collapse, but your guide will tell you some good local stories before you set off on your walk. You will now start the walk up to the crater of Rano Kau and following that the village of Orongo. The path you are following is called Arao Te Ao (the path of power). This starts at the top of the cliff above the cave and leads you through eucalyptus trees and past the National Park office (CONAF). Here they are doing lots of useful work on re-forestation. After about 45minutes you come to the end of the eucalyptus trees and looking back can see the runway. You now walk up slowly through lush vegetation to the view point of Mirador Rano Kao. It takes between an hour and an hour and a half to reach the view point. Looking down into the crater it is almost circular and the circumference of the crater is some 1,650m. At the bottom of the crater is a lake/swamp where rainwater collects and vegetation grows and floats on the water. The original settlers apparently planted oranges, apples, taro, yam, sweet potato, and wild grapes on the banks of the crater. In fact the grapes may have come with the first Catholic priests. There are also medicinal plants grown at the bottom. The height at the top of the rim is some 384m/1,260ft above sea level. Having admired the incredible view you then walk along the rim of the crater to visit Orongo village. This occupies a precarious position on the top of the crater rim with 300m cliffs plunging down into the Pacific on one side and the steep slope dropping into the crater on the other. It is thought that Orongo was never occupied as a permanent place of residence but rather was used only for ceremonies. Eventually a cult emerged here in the late 17th century called Tangata Manu (bird man) which worshiped the Make-Make God. This new religion, which superseded the old ancestor worship, was based on the bird man competition. Each year the chiefs of the island either took part themselves or sent their best warriors to take part in the bird man competition. If you now look out to sea you will see the 3 islands of Motu Kao-Kao, Motu Iti and Motu Nui. The latter is the largest island and it was here that the Easter Island seagull appeared every year to lay its eggs. The object of the competition was to descend the dangerous cliffs and swim to the island and wait there until the first eggs had been laid. An egg then had to be carried while the contestant swam back, climbed the cliff and delivered the first unbroken egg to the king, who was waiting at the village of Orongo. There are 53 houses which were largely reconstructed in 1974 by the archaeologist William Malloy and a group of islanders. Because of its location there were no Moai here. However it was from here that in 1868 the crew of the English ship Topaze took the famous Moai called Hoa Hakananai’a which is currently on display in the British Museum in London. It is in fact 2.5m high and unlike most of the Moai was carved out of basalt. On its back are carved figures representing the bird man and its rituals. In fact in many places on the island there are bird man figures carved onto the rocks. Your guide may well show you some of these as you explore Easter Island. Look out for the birthing stone which is very interesting in the village. After this you visit the very interesting Orongo visitor centre and have a picnic lunch on the edge of the crater. You will then return by car from the visitor centre to the hotel. Afternoon free to “do your own thing” and perhaps explore a bit more of the town of Hanga Roa. Day 12 - Drive to Vaitea to start trek up Terevaka, 511m/1,676ft. Descend to Ahu Akivi and return to town. Today you will drive to Vaitea, formerly a settlement of the English who lived on the island. You will start your walk up to the summit of the extinct volcano of Terevaka from here. You first walk through a forested area until you come out into the wide open slopes leading to the false summit and then further on to a cairn on the true top. You are now standing on the highest point of the island at 511m/1,676ft, and from here you have a full 360 degree view of the island. It is very interesting to be able to see the other two main volcanoes situated on the other points of the island's triangle and then to see the other 75 volcanic cones that cover the island. The walk down can be made more interesting by descending a short way to a minor top and then descending to the eucalyptus tree forest. Thereafter you will see the actual crater of the volcano from where you can continue down to the Hibiscus cave and tunnel. This is an interesting diversion. And, after that, it is an easy walk down to Aky Akivi. The Ahu of Akivi. Unusual because it is one of the few that was build inland. Again the statues were restored by American archaeologist William Molloy and the Chilean Gonzalo Figueroa between 1960 and 1961. The statues are of a very similar style and it is thought that they may have been made and constructed around the same time. Your guide may well tell you the fantastic and amazing story of the “seven heroes”. It is believed by the Rapa Nui people that in the distant past there was a large continent in the Pacific and that a man there one day had a dream that there was going to be a cataclysm, and that the land was going to sink into the sea. He therefore left his body and astral travelled across the ocean until he found Easter Island. Returning to his body he went and told the king who fully believed him. The king then sent 7 explorers in a boat laden with provisions to find Easter Island and prepare it for him and his people. Having found the island they planted crops, trees and made preparations and then returned and fetched the tribe. The king and his people then set out in a fleet of boats but there was a huge storm and only 2 ships survived, that of the king and another captained by his sister. This king was called Ariki Hotu A Matua, and his sister was called Avareipua. Therefore, the Rapa Nui people believe they are descended from the first king and his people. Perhaps the 7 statues are in honour of the 7 heroes. Returning to town lunch will be provided in a local restaurant. The afternoon is free time. Day 13 - Visit Tongariki. Trek to Poike. Fewer people visit this end of the island but the walk is very interesting. There are some fascinating sites and even more amazing legends. First though you take the bus to visit Tongariki. This is the largest and most impressive Ahu on the island with 15 standing statues. Each Moai is very different and it is thought that they represented specific individual ancestors. The restoration work carried out between 1993 and 1996 was based on drawings made by the famous British archaeologist, Katherine Routledge who spent 17 months on the island in 1914. She and her husband commissioned the building of a special sailing boat and then sailed all the way to Easter Island from the UK. Incidentally it is well worth reading of her adventures in her book “The Mystery of Easter Island”. It is a short drive from Tongariki turning right onto a rough road to reach a single house from where you start the trek. It is quite hard work walking to the top of the volcano through long grasses and takes about an hour and a half to reach the summit at a height of 410m/1,345ft. Here there is a crater choked with trees and on the rim an aerial and a solar panel. From the summit you now descend to 2 further volcanic cones Maungu Teatea, and Maungu Parehe. Just below the summit of Poike is a Moai which is said to be one of the oldest on the island, thought perhaps to date from 800 AD. There are carvings on the rocks of the first volcanic cone, including a large head whose open mouth was used to collect rainwater. Just below the 3rd volcanic cone is the edge of some very precipitous cliffs. Thor Hyerdahl explored some of the caves in the cliffs by abseiling down. Here there is another very old head next to a substantial Ahu. These smaller volcanic cones are made from a white coloured rock which was used to make the only female Moai. There are thoughts that there may have been 10 female Moai as there were 10 queens in the early part of their history. One is in the museum, one is buried (for protection against the elements) and one is at Vinapu. You will now cross a pass between the 2 smaller volcanic cones and return to the bus by walking along an old 4 x 4 track. Poike was the territory of the Long Ear people and legend has it that this was where they were all killed in a battle with the Short Ears. Apparently they had built a ditch across the “neck” of the island, filled it with wood and set fire to it. However, the Short Ears crossed at the other end unseen by the Long Ears, climbed Poike and fell upon the warriors below who they then threw into the burning ditch, all except one man who was allowed to live. Poike is the oldest volcano on the island at 10 million years old. Day 14 - Trek the northern coast line to Anakena beach. All the day walks that you have done to this point will have been good preparation for the long hike along the northern coastline. This can be 6 -7 hours or 7 - 8 hours depending on how many things you stop to look at! Don’t forget to take plenty of drinking water as it can be a long hot day and there is no water to be had on the way. The minibus will take you out to Ahu Tepeeu. It is located 8km from Hangaroa and was at some point a large village. There has been no restoration and very few visitors make the effort to go but it is a good place to learn something of the agricultural way of life of the original inhabitants. For instance there are several manavais – stone circles in which crops were grown to protect them from the elements. You will also see the remains of some elliptical houseboat dwellings. Original village houses were built in the shape of upturned boats, and in many of the places you visit along the coast you will see the clear stone foundations of these houses. The foundation stones are set in the ground with drilled holes. Branches were then inserted into the holes, bent over, and laced together and thatched. Your trek starts from Ahu Tepeu and after 20 minutes you come to an unnamed Ahu where there is a burial chamber and more circular agricultural enclosures. Occasionally you will see lying on the ground shards of obsidian that they used as cutting tools. Look out for hollowed stones – used for collecting water. Ten minutes beyond here there is a conical border marker called a Pipi Horeko. Often it was forbidden to cross such a border and the ancestors spirits (or Aku Aku) might kill somebody for such a transgression. Beyond here there is another Ahu which shows a burial tomb inside. After about an hour from the start of the trek you come to some large rocks and small caves, from here you can see the main town in the distance. Your guide may show you the round stone towers that people built to watch the stars. There is a small tunnel hole at the bottom of the towers that you could crawl though and then lie on your back to watch the stars through the top of the tower. You will see in parts of the walk areas where there are many caves and throughout the day you will come across ancient Ahu all with fallen Moai. Some of them are built right on the edge of cliffs and the foundation stones are very reminiscent indeed of Inca workmanship. In some places you will walk up what must have been the roads that bought the Moai to the villages. Today you will see lots of ‘wild horses’. They are owned by locals but roam free. There are lots of hawks on the island and other interesting bird life. After about 2 hours you come to a boat house next to an Ahu, next to a cave, next to a stream (dry). 10 minutes later you arrive at a cairn on a big pile of rocks where the path is well defined. After 3 hours from the start you come to a solitary eucalyptus tree by the path. Descend from here a steep long slope to a flattish area with some fantastic boat houses (4 or 5 of them), an Ahu with fallen statues, a chicken house in the shape of a big boat and a huge burial chamber that is perfectly built with a separate entrance. Half an hour on from here there is a cave with petroglyphs, Hanga Omohi. By now you are turning the corner of the coastline and after another 15 minutes you come to 3 or 4 Ahu like burial tombs and another Tupa tower for looking at stars. After about 6 – 7 hours you come to a lone palm tree and soon after that there is a track to follow with views of Anakena beach in the distance. This is your final destination point and a wonderful place to end your walk. Day 15 - Half day walk to visit caves. Located below Akipi Ahu are a number of interesting caves. Many of them are absolutely huge. They can be some 1500m in length and were formed originally as lava flow tunnels. Don’t forget to take your flashlight! The entrances are often difficult to find which made them ideal hiding places for the Rapa Nui people when Peruvians came to the island with their slave ships. Some have partially collapsed ceilings thus allowing the sunlight in and can be used as gardens for growing bananas, avocado, yam, sugar cane, wild grapes, tobacco, taro and sweet potatoes. Next is the cave of Ana Terongo. This is a very interesting fisherman's cave on 2 levels, with great views of the sea. After this you will visit Ana Te Pora. This was a special cave used to bleach the skins of children. Children were often kept in these caves away from the sunlight and they spent much of their time living and playing in the caves. Next is the cave of Ana Kakenga. This has two windows looking out to sea with a 40m drop to the rocks below. After looking at the cave sites it is a good 1 hour walk back to the road for the vehicle pick up. Return to Hanga Roa for a free afternoon. Day 16 - Free day. Optional activities. We felt that after your intense time of tours and treks on Easter Island that you would appreciate a full day to relax, take in what you have seen, do some souvenir hunting, have your passport stamped at the Post office, send those iconic postcards to friends and family, or perhaps try out one of the other activities that are available on Easter Island. We are able to book any of the following in advance. Prices are available on request and will depend on the number of people wishing to pre-book these optional activities. Day 17 - Fly to Santiago. Time at leisure. With great sadness and with perhaps the forlorn hope that you might return one day it is time to leave the island. With so much information and so many theories that you have absorbed you will undoubtably want to read more on the subjest in years to come. When you get back to the UK you might wonder if it all really did happen or whether it was a dream. You now transfer for the 5 hour flight back to Santiago. Rest of the day free to do as you please. Day 18 - Fly to London. After breakfast you will be transferred to the airport for your flight bacl to London. Day 19 - Arrive London. This was a wonderful trip full of amazing experiences from the salt flats and steaming geysers of the Atacama to the iconic statues (moai) of Easter Island. Our special interest in wildlife and especially birds was well catered for with four species of camelid and three species of flamingo in the Atacama along with sightings of vizcachas near the Tatio geysers and Fabian's lizard which is only found on the Atacma salt flats. Our guide was also very knowledgeable about the plants we encountered on our walks and pointed out many different medicinal plants including Riga Riga which is sometimes used in the delicious pisco sour drink which we enjoyed sampling at Happy Hour every evening! Easter Island was all we expected and much more. The walks were exceptional and we visited many incredible places without seeing any other tourists. Equipped with head torches our guide even took us down some of the island's many lava tubes where we spotted endemic ferns and wild guavas growing. We can't recommend this trip too highly and would love to return to explore more of this fascinating region. The two locations are very different, but have in common that they both have a haunting atmosphere and neither is very crowded. Where Mountain Kingdoms really score is by offering longer than the standard 3 day trip to Easter Island and, although it is a small island, there are plenty of good walks and fascinating archaeological sites to explore. The walking was not strenuous and there was a lot of spare time, so it was good that the rooms in both the main hotels had a lovely environment and opened onto small, almost private terraces for reading or drinking. There is inevitably a lot of flying involved but it is worth it to see places most people in Britain never get to. A superb combination/contrast in this two centre trip, really well-paced and giving time to explore both places well. Well-organised and good itineraries. In each destination there were days when we did not see other tourists. I remember reading Thor Hyerdahls book Aku Aku when I was about 14 years old. I thought it was the best book I'd ever read and it left an indelible impression on me. Later I saw a re-run of Thor Hyerdahls Kon Tiki film and I promised myself that one day I would visit Easter Island. It did not disappoint, it is a stunningly beautiful island and the mystery still remains.